Which are the most likable CNY video ads on YouTube in Malaysia? Find out how we rank them by "Like Ratio". Internet platforms like YouTube have enabled more brands to produce and distribute Chinese New Year video commercials, advertisers are no longer limited by the higher barrier of entry to TV commercials. Every year, we are seeing more and more brands producing festive video ads, from promo-driven, music video style, family's value to story-telling. Let's find out which brands have the most well-received CNY video commercials this year. The video must be intended for Malaysia market (even Singapore is excluded). The video must have at least 100K views on YouTube. Other media platforms like Facebook are not considered here. We have seen some decent videos with less than 100K views, such a waste! Imagine if a brand invested tens of thousands (or more) on video production, why not allocate at least RM5K on YouTube to distribute the video's reach? How to get 100K views on YouTube? CPV (Cost per View) on YouTube is RM0.05 on average, hence to achieve 100K views RM5K media budget is required, 1M views with RM50K budget and so on. CPV ranges from RM0.01 to RM0.10 or more depending on various factors. Minimum 100K views it is, but shall we measure how well-received the videos are by the number of views? Not quite as the views can be bought by advertising, let's rank them by Like Ratio instead. What is Like Ratio? This is simply the ratio of likes vs dislikes on a particular YouTube video. For example, if there are 90 likes and 10 dislikes on a video, the Like Ratio is 90% in this case. As a guideline, the video commercial is considered well-received if the Like Ratio is more than 80%, not so good if it is below 70%. The more views the video has, the more relevant the Like Ratio is. All the statistics of YT Views and Like Ratio is updated on 13 February 2019 (CNY day 9) so the numbers could be different by the time you read this. Inspired by true events, this story is about a boy who managed to make meaningful progress in his life, not only because he believed in himself, but also because his two biggest supporters believed in him. Happy Chinese New Year from all of us at RHB. At the time when our hearts are open, is when the greatest #blessings are seen. Gong Xi Fa Cai. 爱不能用言语来衡量. Ah Pa and Ah Girl have always been close. But an ever-growing distance between them starts appearing over the years. Why? 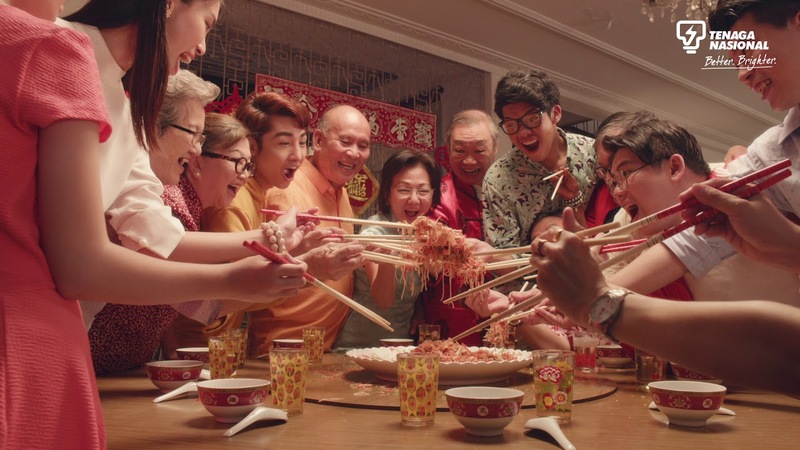 Follow their story in Prudential’s 2019 Chinese New Year film that celebrates the people that DO. A young man struggles to find his place in the world. It's only when he stops to listen to what grandpa is actually saying does he only realise the true wealth of his heritage and what he is truly capable of. #6. Lat Talilat Tali Tam Pom | Life's so easy with Panasonic this CNY! Oh no! What to do? An unexpected company is coming, and the house is a wreck! Don't know where to start? This CNY, we want to get all festive-ready the #Panasonic way! Reunion done, makan done… now what? Not many realise, the hours between reunion dinner and midnight on the eve is the most ong-spicious… but why hor? The greatest of gifts are always the one from the heart. As we always believe, Happiness is Priceless. Happy Chinese New Year from MR.DIY. Our CNY film is here! Get ready to be entertained with beautiful performances, impressive voices and stunning outfits. John Tan, and many more! Start your happy, beautiful year with Watsons! Leng Sou got one more! #1. Samsung CNY 2019: What's wrong with Ma-ma? As we grow older, let us never grow apart. This Chinese New Year, we’re celebrating Grandma's amusing ways to connect with her tech-savvy grandchildren! Even the simplest act can put a smile on a person's face. Make someone happy this Chinese New Year, give the gift of time at www.maybankheart.com. #3. YES CNY 2019: Wishing you a Konfem Huat and Amazing Chinese New Year! Say YES with your loved ones to an Amazing Chinese New Year! We promise to keep empowering connections that matter with technology that Konfem Huat this year! Time changes, but the taste of love will never change. Treasure sweet moments and nostalgic memories while you share the classic taste of F&N Orange Crush and Classic Sarsi with your loved ones this Chinese New Year. This Chinese New Year, let us not forget to cherish one another and be thankful for the times we get to spend with our loved ones. Sell Kitchen Tools - Earn Extra Money This Lunar New Year! Ang Pow, also known as "Ya Sui Qian", is a traditional wish of youthfulness and good fortune during Chinese New Year. Wishing you the vitality and joy of youth this festive season! Gong Xi Fa Cai from Yeo’s! Happy Chinese New Year from TOP Detergent Malaysia. May your year be filled with an abundance of joy, health and prosperity as we count down to the coming days of delicious food and lively gatherings with all our loved ones. Here's to wishing you "No.1" in everything that you do! Celebrate the #BuenoSideofCNY with our special Kinder Bueno Chinese New Year pack with 6 photo props! #5. Darlie Malaysia CNY 2019: Brush Together, Huat Together! A family that brushes together, “huat” together! Usher in prosperity with Darlie Charcoal Gold toothbrush, now with a ‘Buy 2, Free 2’ promo for a limited time only! Darlie wishes you and your family a happy and prosperous chinese new year! Which is your favourite CNY video commercial? As you know by now, Like Ratio is a key indicator of whether the video is liked (or disliked) by the mass audience. It is also one of the important factors how YouTube ranks and recommends your videos organically. Like Ratio or not, our personal favourite is TNB CNY 2019 - The ONG-est Hours, for its all-round presentations with great talents, cool videography at the same time covering most of the CNY essences. What about you, which one is your favourite? Do leave a comment below if we missed out any great local CNY video commercials on YouTube.